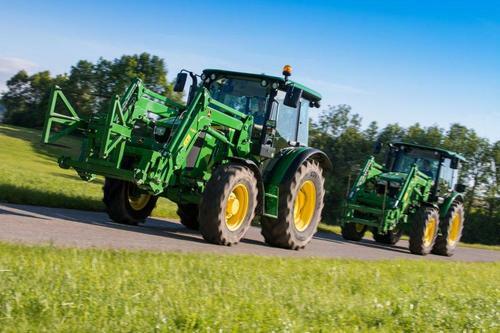 The next generation of John Deere’s 5M Series tractors has been designed to meet the needs of small and medium size livestock, arable, mixed and speciality farms. The range consists of four higher horsepower models from 75 to 115hp and features Stage III B compliant engine technology. •	As a newly designed 5M Narrow version with an overall maximum width of 1.72m. The 5M Narrow tractors meet the needs of speciality producers such as vineyards, fruit and hop farms. The 5M Series diesel-only engines are equipped with fuel efficient common rail technology. Compared with previous models, these engines feature electronic injection which contributes to fuel savings of 11 per cent on the 5085M, for example. A wide choice of transmission options include a 16/16 speed unit with a synchronised or power reverser, and a 32/16 speed transmission with power reverser and electro-hydraulic HiLo function. Both the 16-and 32- speed transmissions are available with a ground drive PTO as well as in a creeper version, which can reduce the speed to 300m/hr at rated engine speed. All the transmissions feature a unique park lock as standard, which ensures that the tractor stops safely when parked on steep slopes. A number of additional options are available for operating a wide range of mounted implements and trailers. These include a standard 540/540E or optional 540/540E/1000 rpm PTO, and a standard mechanical hitch control with an electro-hydraulic control option. A powerful hydraulic pump with a maximum flow of 94 litres/min can supply two or three rear SCVs. The deluxe three SCV configuration features selectable hydraulic detents and float control on one SCV. Two mid-mounted SCVs are also available for operating loaders or front-mounted implements, and a joystick control option is available for both. John Deere’s exclusive mid-frame design on the 5M Series not only offers additional strength and durability but also reduces noise and vibrations. For extra versatility the tractors can be equipped with an optional front hitch, front PTO and matching front loader. The 5M Series tractors can be supplied front loader-ready or ex-factory with a front loader/front implement package as required. Two front loaders with different performance levels are available for the new 5M Series tractors, the H260 and H310. The joystick control includes features such as activation and deactivation of the loader suspension, a memory function and engagement of a third function with a diverter button, which is conveniently located on the left-hand side of the joystick. The same package is also available with an optional integrated gear shift button. This allows the operator to change gears using a single lever during loader work. Compared to previous models, the H260 and H310 front loaders have been redesigned to provide more accuracy and improved reach, so the full lift height can be utilised to dump material into the trailer. Visibility has been improved with a new hood guard, and there is an additional 12 degrees rollback for more efficient filling of the loader bucket.